Give your body the freedom to adjust with the Raynor Apollo MFT9450 Multi-function Ergonomic Task Chair. Featuring high-quality ergonomics that's also affordable, this chair will change the way you think about sitting. Updated ergonomic controls allow for a more customized fit to your body, and comes with a supremely breathable mesh back and amply-padded seat cushion for the utmost in comfort while you work. Synchro-tilt and pneumatic height adjustability bring you closer to your ideal postures while seated with the Raynor Apollo Task Chair. Customize your Apollo in a collection of colorful fabrics for a seating solution that boasts your unique style. 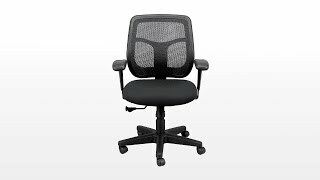 The Raynor Eurotech Apollo MFT9450 Multi-function Ergonomic Task Chair is available with a black mesh back and your choice of any of these custom fabrics on the seat at a small upcharge. We recently bought a second MFT9450 for my wife's desk, as I have been very pleased with my MFT9450 chair that I have used in my den these past twelve months. I have a fabric seat, she went for a leather seat. I think the fabric seat is better in that the leather seat tends to be a little slippery, but then again it is brand new. As my headline said, the chair is extremely adjustable: seat height, seat tilt, back tilt, armrest width. It would be nice if one could adjust the armrests forward and back in cases where one has to contend with getting to close to the lap drawer, but alas it lacks that adjustment, and it has not proven to be an issue. Assembly takes some study and some muscle, and the box it comes in is quite heavy. So set aside an hour and eat your Wheaties. Recently asembled - I had a moment of regret at 1st, but once I determined how to change the seat tilt, I was very happy. The seat cushion is thick and soft, and the contour fits my bottom perfectly. The adjustment levers are positioned for easy access. The back position stays where you put it and the back height is perfect for my short stature. The armrests are comfy and height/width adjustable too. My only issue was with the shipping (box was badly battered) and formaldehyde like smell of the chair. I'm sure the smell will diminish over time. I could sit and watch movies on my computer all night and be as comfortable as can be. I am VERY HAPPY with my purchase!! $293.00 List Price: $512.00* The list price is the same as the MSRP (Manufacturer's Suggested Retail Price). It may not necessarily be the price at which the product is sold.